Good spinal alignment in a seated position keeps the upper body the same with ear, shoulder, and hip in line. Sit in your chair so that your feet are flat on the floor and your hips are at about a 90 degree angle. At least once every day do a posture check-try some of the following visualizations. Choose a few that work best for you. Think of these images when you are sitting, standing, and walking throughout the day. Walking is a great way to exercise to burn calories, lose weight, decrease stress, decrease blood pressure, improve bone health, improve feelings of well being. Walking is easily done indoors on a treadmill, in the hallways of a mall, school, or office; or outside anywhere. Walking with correct form can strengthen weak muscles, stretch tight muscles, and improve breathing capacity and posture. 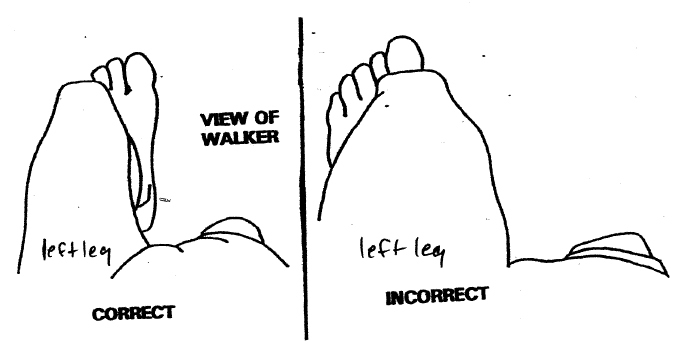 Walking with incorrect form can lead to neck, back ,hip, knee, and ankle problems. Pick a couple of these images to focus on each time you walk. You don’t need to remember them all. Try to walk regularly, building up to at least 30-40 minutes, 4 times per week depending on your exercise goals. If you are just starting , begin with 5 minutes and gradually increase your speed and time. Wear supportive shoes, preferably a pair of athletic shoes designed for walking and fitted to your feet. You should always feel like you can breathe evenly as you walk and could hold a conversation- this is a good test of a moderate exercise intensity. Goal: reduces pain/imbalances in shoulders, back, sacroiliac joint, pelvis, hips, knees, ankles, feet and prevents re-occurrence of instability and injury. Purpose of repetitive exercise – increase flexibility of buttock muscles (gluteals) and hamstrings: decrease lower back (lumbar) flexion movement/ instability; train to move at hip joint rather than the lower back which improves stability in spine. Note: large hip (gluteal) muscles and leg (quadriceps and hamstrings) are made for power and lifting. Not your back muscles which are made for endurance for holding up your trunk and supporting your spine. Also hip joints are a ball and socket type joint and offer more range of motion and flexibility with bending opposed to the small planar joints in your spine if you bend too much are strained easily. If you are having difficulties getting your spine or head against the golf – do not push beyond your comfort zone – work within your available range which is different for every person. Practice this bending 10-30 repetitions 2-3 times per day. This is a mindful exercise and you must concentrate on technique which is more important than repetitions. It is like retraining your mind and body to write your name differently than you have for all these years – you have to think every time you start the activity to facilitate effective change. Very important and effective: practice this way of bending and moving every time you start to bend forward; lift; get up and down from sitting; standing and working at a counter top; golfing. Think of this and move this way several times throughout the day. Repetition is what creates change. Practice these knee bends 10-30 repetitions 2-3 times per day. This is a mindful exercise and you must concentrate on technique which is more important that repetitions. It is like retraining your mind and body to write your name differently than you have for all these years – you have to think every time you start the activity to facilitate effective change. Very important and effective: practice this way of bending and moving every time you sit down and get up from a chair and even your car; when you are standing/bending in the kitchen; watching sports; waiting in line at the grocery store; golfing; several times throughout the day. Repetition is what creates change. Goal-reduces pain/imbalances in the back, sacroiliac joint, pelvis, hips, knees, ankles, and feet and prevents re occurrence of instability and injury. Keep STANDING and CONTROLLED SMALL KNEE BEND principles in mind-start to be mindful of position and movement in stand and with controlled small knee bends and it will be help walking to be improved and less imbalance created in your muscle and joints. the ribcage, and fills the lungs with air without losing core control. back and sides of the ribcage. supportive corset for the whole trunk. your overall breathing capacity and body awareness. the upper body and minimize pressure on parts below. Practice ribcage breathing first lying on your back with your knees bent, then progress to a seatedposition with feet and legs spaced comfortably apart. Place your hands at both sides of the ribcagewith fingers in front and thumbs at the back. 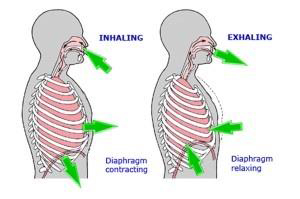 Slowly inhale (breathing in) and let your ribcage expandout to the sides and towards the back and then slowly exhale (breathing out) letting your ribcage relaxand move down and in. DO NOT hold your breath! Draw the abdominal muscles in to the waist pullingyour button towards your spine. Hyperventilation is possible if this breathing exercise is done too many times continuously, so normalbreathing should be resumed after 3 or 4 deep breaths before repeating. those muscles that are necessary to perform any given task.ARE YOU WILLING TO RELAX? 6. Be willing to practice relaxation in the manner you are instructed. Together we will find a method that is effective for you. Check your breathing-make sure you are not holding your breath. Try deep breathing for relaxation;and diaphragmatic breathing as a habit for breathing throughout the day. Use timers to take a break from sitting activities every 30 minutes. This will help give your eyes, mind,and muscles a break. Get up and walk if you can or perform breathing and sitting stretches. Try different chairs or supportive cushions (lumbar cushions). Saddle seats are highly recommended,but expensive. Try sitting on a corner of your chair and imagine you are sitting on a horse saddle. Try a small rolled up towel on your tail bone (sacrum) to assist your forward sitting position. Pelvic Rock– rock forward arching your back, then back, flattening your back. Inhale as you rock forward, exhale as you rock back. Then rock side to side naturally. Posture Lift– hands on top of your head, raise the crown of your head into your hands with resistance, hold for 5 counts, and relax for 5 counts. Inhale as you stretch your spine towards the ceiling. Shoulder Rolls– move your shoulders up, back, down. Inhale as you move your shoulders up and back and exhale as you relax your shoulders down. Neck Stretches– chest up, shoulders back and tighten your abdominal muscles, side bend bringing your ear to your shoulder while looking straight ahead; hold for 10-20 seconds while performing 3-5 sets of deep breathing. Rotation- turn head to the right, hold for 10-20 seconds while performing 3-5 sets of deep breathing. You can also perform these movements in small amplitudes without holding. Chest and Shoulder Stretch– chest up, raise your arms up reaching for the ceiling, take a deep breath and reach higher. Exhale slowly lowering your arms to your side like you are making an angel in the snow. Back Stretch– lean forward rolling your spine down from head to neck to mid back, then low back. Reach your hands to your toes. Relax in this position and perform deep breathing. (Do not perform this exercise if you have osteoporosis, osteopenia, or pain. Wrist Stretch– place the palms of your hands together with fingers apart. Lower your hands towards the desk while keeping your hands together. Reach your arms forward and bend your wrists down, and then up. Check your breathing-make sure you are not holding your breath. Try deep breathing for relaxation; and diaphragmatic breathing as a habit for breathing throughout the day. Use timers to take a break from sitting activities every 30 minutes. This will help give your eyes, mind, and muscles a break. Get up and walk if you can or perform breathing and sitting stretches. Try different chairs or supportive cushions (lumbar cushions). Saddle seats are highly recommended, but expensive. Try sitting on a corner of your chair and imagine you are sitting on a horse saddle. Try a small rolled up towel on tail bone (sacrum) to assist your forward sitting position. Trade 2-5 minute neck and shoulder rubs with your co-worker or spouse, or perform a self massage to reduce muscle tension. 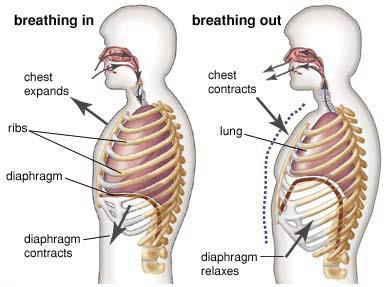 Deep Breathing – hands on sides of ribs, cleansing breath in through nose, exhale out mouth. Pelvic Rock – rock forward arching your back, then back, flattening your back. Inhale as you rock forward, exhale as you rock back. Then rock side to side breathing naturally. Posture Lift – hands on top of head, raise crown of head into hands with resistance, hold for 5 counts, relax for 5 counts. Inhale as you stretch spine towards ceiling. Shoulder Rolls – move shoulders up, back, down, and breathe. Neck Stretches – chest up, shoulders back and tighten abdominal muscles, side bend bringing ear to shoulder while looking straight ahead; hold for 10-20 sec. Rotation- turn head to right, hold for 10-20 sec. Can also perform these movements in small amplitudes without holding. Chest & Shoulder Stretch – chest up, raise arms up reaching for the ceiling, take a deep breath and reach higher. Exhale slowly lowering arms to side like you are making an angel in the snow. Back Stretch– lean forward rolling spine down from head to neck to mid back, then low back, reach hands to toes. Relax in this position and perform deep breathing. (Do not perform this exercise if you have osteoporosis, osteopenia, or pain). Wrist Stretch-place palms of hands together with fingers apart. Lower hands toward desk while keeping hands together. Reach arms forward and bend wrists down, then up. Listen to your body and stop with any pain-can try exercise with less motion or intensity. Take a deep breath through your nose. As you inhale, let your belly rise into your hand. Keep your chest from rising as if you have a book resting on it. As you exhale through pursed lips as though you were whistling, feel your hand go down. Take your time exhaling using a slow count of 7-10 in (inhale) and a slow count of 7-10 out (exhale). Belly-breathing helps you engage your deep inner core muscles for improved core stability. Belly-breathing can be progressed to varying positions and activities to challenge your breathing. Inflammation is one of the body’s natural ways of protecting itself. It includes many chemical reactions that help to fight off infections, to increase blood flow to places that need healing, and to generate pain as a signal that something is wrong with the body. Unfortunately, as with any process in the body, it is possible to have too much of a good thing. Avoid unhealthy fats. Trans-fats that are high in omega-6 fatty acids cause inflammation. These fats are found in many animal products and in any foods designed to have a long shelf life. Monounsaturated fats, like olive oil, are better choices. Omega-3 fats, like fish oil and flax oil, are especially good for decreasing inflammation. Eat fruits and vegetables. Many studies are showing that a diet high in fruits and vegetables is good for decreasing inflammation. The more servings eaten, the better. 8-10 servings per day is a good goal. ½ cup-1 cup servings. Eat Fiber. 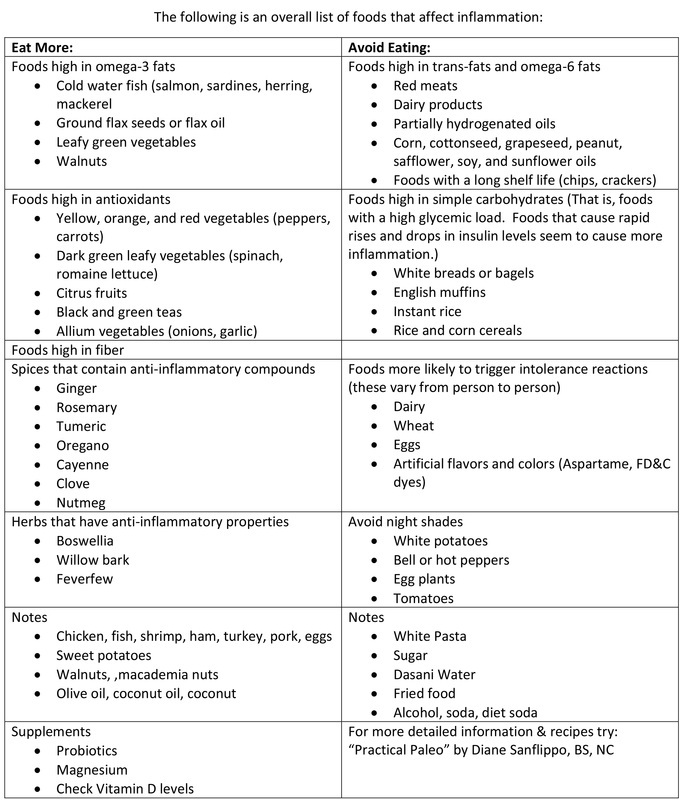 Diets high in fiber are shown to help decrease inflammation. A good goal is about 30 grams per day, ideally from a diet rich in whole grains, fruits, and vegetables. Drink more water. Drink ½ your weight in ounces per day. The information in this handout is for general education. Please work with your health care practitioner to use this information in the best way possible to promote your health. you stand up too quickly. If you like the bath you can make a bulk version of the dry ingredients and store then for future use. If you have a fun container to put it in, this would also make a great gift! Just mix up all of the dry ingredients and store it in something with a lid. Then just grab 1 cup of the mix and 1 cup of vinegar when you want a bath. Do not overdo it. Listen to your body and rest when needed. Work on projects in stages. Weed a little bit every day. Don’t save it up for a full day marathon. It is good to do standing extensions (standing up and bending backwards or reaching up to the sky while taking in a deep breath). Stretch in the opposite direction of the position that you have been working in. Should be done daily or 3 times per week for a strong healthy body. There are many wonderful exercise routines and philosophies available today at classes, on DVDs, TV, books. I recommend seeing a physical therapist if you have medical problems, or a trainer at a local gym, or sign up for a class, talk to friends. Good programs- Pilates, Yoga, Tia Chi, Qiqong, water aerobics. Gardening is one of life’s greatest pleasures, as is enjoying the fruits of your labors. Relax your mind, exercise your body, then sit back and let your senses take in all the beauty you have helped nature to create. NO stretching at end ranges with your neck. Turn your whole body and DO NOT turn your head to its full limits. Perform small movements of head and neck side to side and turning right to left and looking down, but remember DO NOT stretch, just perform small movements to lubricate joints. DO NOT roll head backwards or look up to the ceiling-causes too much damage and irritation to upper neck vertebrae. Start good posture with lifting up chest and bring chin in. Avoid sitting in a recliner that puts you in a “C” position which is legs up, back rounded, head forward. 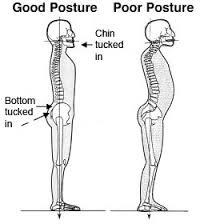 Instead sit in a chair with buttocks all the way back/pillow behind back for support/ and can put feet up on a stool if needed-recheck that head is not leaning forward. Roll shoulders up, back, and down to loosen up tight shoulders. Never hold you phone between ear and shoulder-this compresses your spine, tightens your muscles, pinches nerves and sets you up for injury. Deep breathing throughout the day to relax and decrease tension and stress. Check head, neck, hands, & jaw for tension and holding throughout the day. Practice performing activities with less tension and tightness in your body. If your head feels heavy or tight-lie down in a supported position when able. 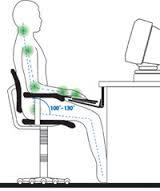 Check for proper posture which is a key to reducing muscle tension in the head, neck, and shoulders-be mindful of good chairs with goo support. Sleep is very important to heal your body and for wellness. Ideas to help with stress: stress management throughout the day, warm bath or shower, heating blanket or pad, ice pack, meds by doctor or over the counter supplements, relaxing music, meditation, relaxation techniques, going to be early, ear plugs, eye mask. Through clinical experience by pain specialists it is proven that psychological factors contribute to both the development and recurrence of muscular and joint pain/imbalances, inflammatory diseases, and somatic dysfunction. spine/ mid-back; while blood vessels to other parts of the body constrict restricting “flow out” of toxins. If this anxious / fight or flight state persists for a prolonged period, there has been the rise in Strain Counterstrain tender points throughout the thoracic spine and ribs. This can explain some of the digestive issues common in persons suffering from prolonged anxiety given the fact that blood vessels remain constricted. Being aware of your psychological state (stress, anxiety, and worry) and your diet can affect your body’s physical balance and wellness. Mindfulness, meditation, prayer, counseling, writing in a journal, exercise, medication, diet can all affect your state of mind and therefore assist in healing. thing when getting up in the morning and wait at least 20 minutes before eating or taking other medication. During stressful episodes there is a release of catecholamines which prepares the body for the “fight” or “flight” response. Circulation is reassigned away from the digestive system. Dilation of blood vessels provides a “flow in” of nutrient rich blood to feed heightened motor activity particularly to the thoracic spine/midback while blood vessels to other parts if the body constrict restricting “flow out” of toxins. If this anxious/fight or flight state persists for a prolonged period, I have seen the rise in strain counterstrain tender points throughout the thoracic spine and ribs. This can explain some of the digestive issues common in persons suffering from prolonged anxiety given the fact that blood vessels remain constricted. Being aware of your psychological state (stress, anxiety, and worry) and your diet can affect your body’s physical balance and wellness. Mindfulness, meditation, prayer, counseling, writing in a journal, medication, and diet can all affect your state of mind and therefore assist in healing.